After thoroughly enjoying the first ever VH Awards in the epic and highly entertaining December newsletter, I have been itching to share my own favourites from last year. Despite everything that happened throughout 2017, there was one thing I could count on for a much welcomed distraction from the exhausting barrage of bad news and that’s exciting beauty launches! 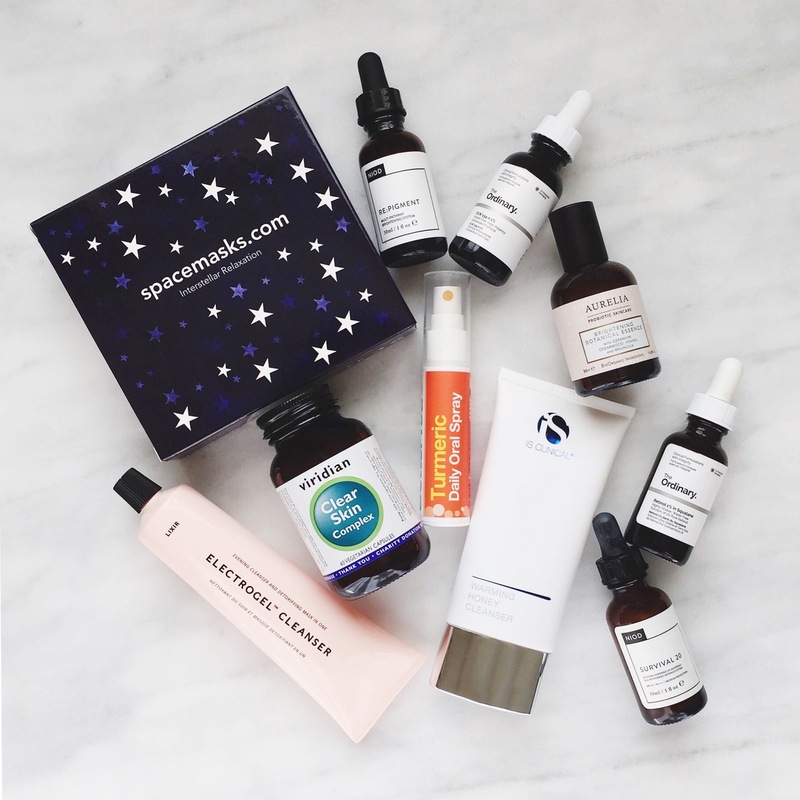 I think last year was an incredible one for skincare and I completely fell in love with so many of the new products that made their debut on the site. When it came time to look through my skincare stash to write this article I thought I would have a hard time narrowing down my picks, but I found it surprisingly easy. These ten products stood out to me because not only was I excited about them when they first launched, but I am still happily using every single one every week right now. The list is not in order and I have added a cheeky bonus (or three!) at the end, but here are the products that survived the initial “newness” hype and managed to secure a place among my all time favourites. Ingredients: Aqua (Water), Caprylic/Capric Triglyceride, Oleyl Erucate, Cetearyl Alcohol, Butyrospermum Parkii (Shea) Butter, Glycerin, Cetearyl Glucoside, Bentonite, Phenoxyethanol, Oryzanol, Pelargonium Graveolens Flower Oil, Benzoic Acid, Glyceryl Laurate, Salvia Officinalis (Sage) Oil, Tocopherol, Dehydroacetic Acid, Rosmarinus Officinalis (Rosemary) Leaf Oil, Xanthan Gum, Anthemis Nobilis Flower Oil, Rosa Damascena Flower Extract, Citronellol, Geraniol, Limonene, Linalool. I have to start with this beautiful product because it has been a staple in my bathroom cabinet ever since it launched. Cleansers are one of my favourite skincare categories and despite having far too many in rotation (more than 10, but less than 20, I think…! ), this still managed to stand out from the crowd. It has a lovely whipped, creamy texture that feels light and cooling on the skin and the delicate botanical scent adds a luxurious sensorial element to quite an understated, but still very effective product. Even though this cleanser has been designed to detoxify the skin from pollution, dirt, toxins and free radicals through the negatively charged bentonite clay, I love using it in the morning too. It is hydrating without leaving a film on my skin and I love how soft and balanced my face feels after I use it. This is one of the few cleansers I would recommend for most skin types because it gives the pores a deep clean without causing any dryness or irritation. I also like that you do not need a washcloth to remove it, so if you have sensitive skin this is a great option for you, too. Colette Haydon (founder/dermo-pharmacy doctor/formulator extraordinaire) is a legend in the cosmetic industry and she got it so right with Lixirskin. Everything from the branding, ingredients and packaging made the launch one of the biggest and most successful of the year and for good reason. I love all the products in the range (except the ones with lactic acid as I am allergic), but this cleanser leaves my skin feeling clean, balanced and glowing, which is exactly what I’m looking for when it comes to great skincare. If you’re new to the brand you can read my full review here. Ingredients: Cyclopentasiloxane, Aqua (Water), Zinc Oxide, Titanium Dioxide, Glycerin, PEG-10 Dimethicone, PEG-9 Polydimethylsiloxyethyl Dimethicone, Propanediol, Acrylates/Ethylhexyl Acrylate Crosspolymer, Dimethicone/PEG-10/15 Crosspolymer, Hexyl Laurate, Polyglyceryl-4 Isostearate, Dimethylmethoxy Chromanol, Inulin, Alpha-glucan oligosaccharide, Solanum Lycopersicum (Tomato) Fruit Extract, Superoxide Dismutase, Xanthophyll, Pinus Pinaster Bark Extract, Polygonum Aviculare Extract, Alteromonas Ferment Extract, Padina Pavonica Thallus Extract, Arginine, Glycine, Alanine, Serine, Valine, Proline, Threonine, Isoleucine, Histidine, Phenylalanine, Aspartic Acid, PCA, Sodium PCA, Sodium Lactate, Squalane, Simmondsia Chinensis (Jojoba) Seed Oil, Tocopherol, Melanin, Sucrose, Tapioca Starch, Stearic Acid, Trimethylsiloxysilicate, Pentylene Glycol, Butylene Glycol, Trisodium Ethylenediamine Disuccinate, Sodium Chloride, Dipropylene Glycol, Tromethamine, Ethoxydiglycol, Alumina, Potassium Sorbate, Sodium Benzoate, 1,2-Hexanediol, Ethylhexylglycerin, Phenoxyethanol, Caprylyl Glycol. 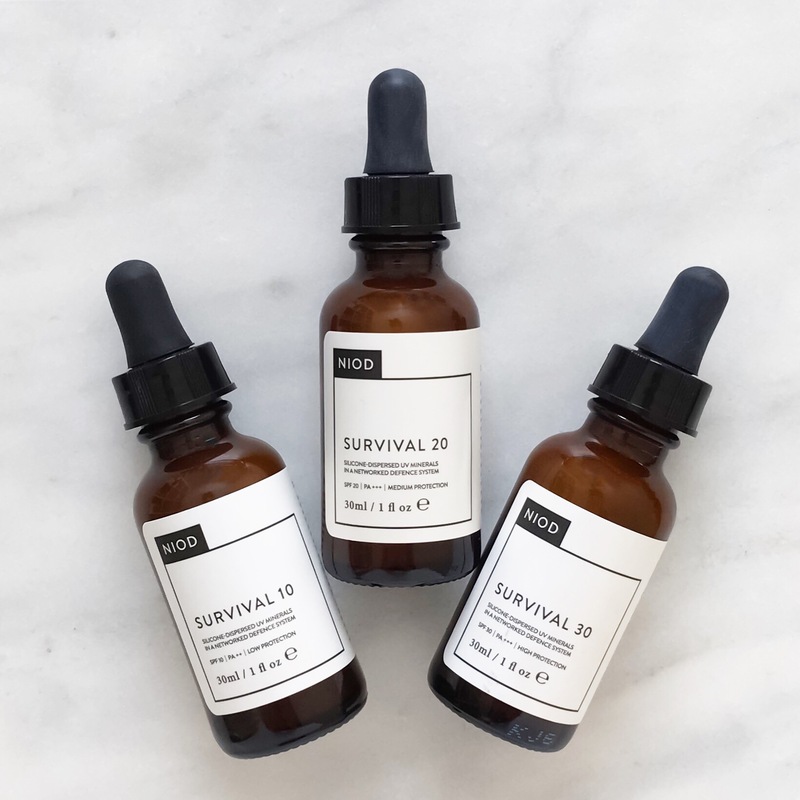 Another hugely successful launch from last year is of course the entire Survival range from NIOD. Just like with everything they do, the disruptive brand took a novel and progressive approach to sun protection and I have yet to find anything that compares to it. Survival 20 is a supercharged sunscreen that also protects against free radical oxidation, infrared and blue light damage, glycation skin aging and environmental stress (pollution/smog). I love almost everything about this (can we please have pumps and bigger sizes?!) and it has worked so well for my combination acne prone skin through summer, autumn and now winter. It doesn’t break me out, doesn’t leave my skin looking greasy at the end of the day, doesn’t feel heavy and mostly importantly, doesn’t give me that awful “white cast” that some mineral-based sunscreens can do to darker skin tones. This launch made it so easy for me to use sunscreen every day and considering how hot it was last summer, it couldn’t have come at a better time. I cannot recommend this lineup enough and if you want to read more about it you can check out my review here. For me, Survival 20 is the perfect balance between a sunscreen and an antioxidant serum, and it was one of my most used products of the year. Ingredients: Glycerin, Honey/Mel/Miel, Myristic Acid, Olive Oil, PEG-7 Esters, Papain, Polyglyceryl-10 Behenate/Eicosadioate, Royal Jelly, Camellia Sinensis Leaf Extract, Polysorbate 80, Sodium Lauryl Sulfoacetate, Propolis Extract, triethanolamine, 1, 2-Hexanediol, Caprylyl Glycol. Technically this product is a relaunch as Gill explained when she awarded it “The Resurrection Of The Year”, but since I had never used it or even heard of it until last year I am including it on this list. iS Clinical have been one of my favourites brands for years thanks to the brilliant skin saving Sheald Recovery Balm, but this is something else. 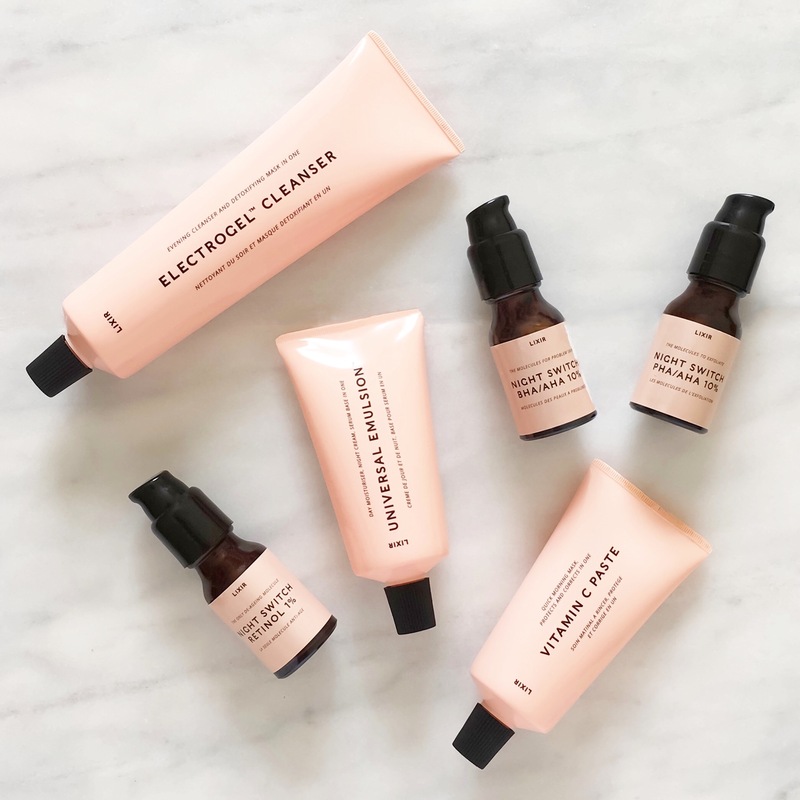 It was so pleasantly unexpected and different to everything else I have tried (and loved) from this innovative cosmeceutical brand and I used it daily for about two weeks when it first launched because I was enjoying it so much. 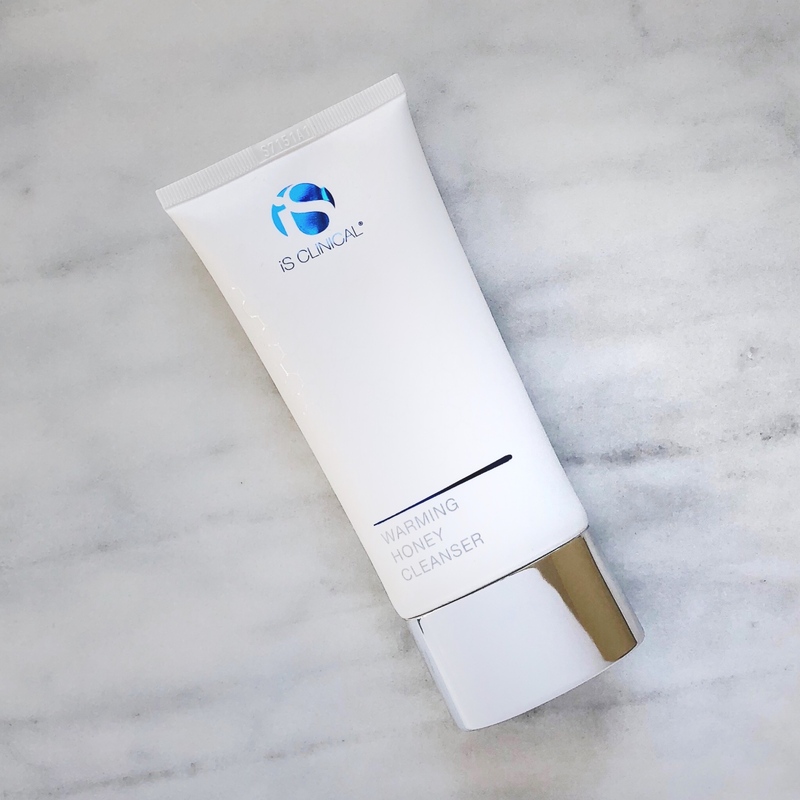 This cleanser is exactly as the name suggests – honey based (an impressive 40%) and gently warming, but there is so much more to it. It is more like a yummy, luxurious treatment product thanks to the honey, royal jelly, papaya enzymes and green tea, which work together to provide antibacterial, antimicrobial and anti-fungal support as well as light exfoliation and ceramide barrier protection. It also deep cleanses and minimizes the pores, helps to heal breakouts and calm inflammation. It has such a unique honey-gel texture that feels amazing on the skin thanks to the warming sensation and the scent (an oaty/honey mix) is so comforting and relaxing. I use this as my morning and second evening cleanser and love to leave it on as a mask for 5 or 10 minutes to get the most out of the ingredients. Despite the almost sticky/runny, but somewhat stiff texture it breaks down very well once you begin to massage it (you need about a 50p size dollop) and a big bonus is it rinses completely clean with just warm water. This could easily stand alongside much more expensive or “high end” marketed products out there (especially in green beauty) and would work well for pretty much all skin types, except maybe those with very dry skin as it really does give a deep cleanse. I love using this because it adds a nice spa-like feel to my routines and I only wish they had a travel size so I could take it with me whenever I travel (hint, hint!). 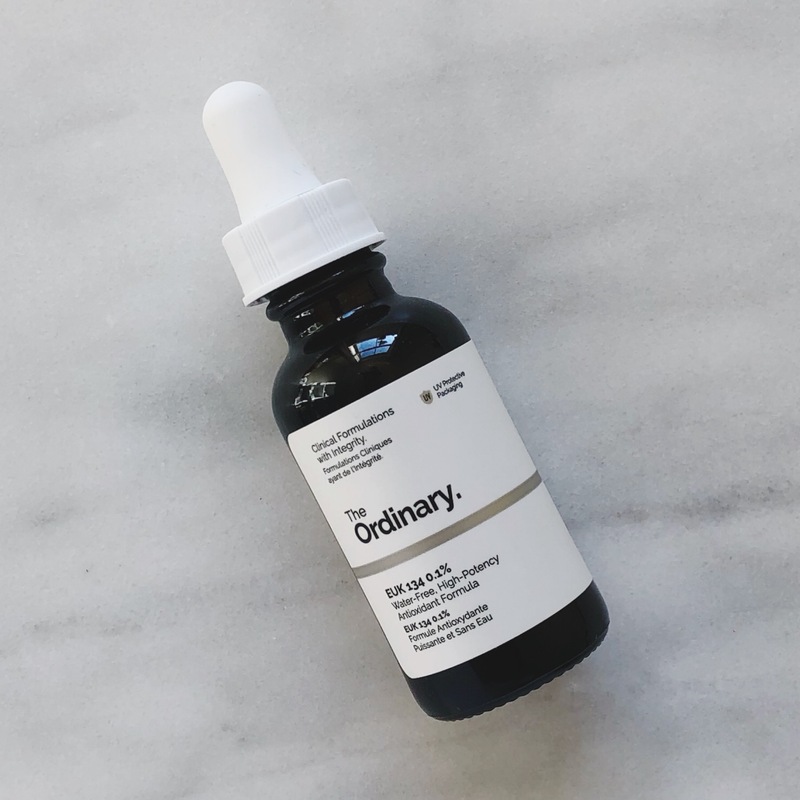 The Ordinary has just gone from strength to strength since the surprise launch back in 2016 and this is now one of my all time favourite products that they make. I have been using some form of retinol for a few years now and I swear by it for helping my breakouts to heal and fade fast and for keeping my skin looking plump and glowing. This has been a staple ever since it launched and I use it multiple times a week without fail. Retinol is one of the very best ingredients you can use to support your skin against everything from fine lines, wrinkles, discoloration and blemishes because it encourages faster cell turnover so the skin can heal quicker and look healthier as we age. What I love about this is that thanks to the base of squalane it sinks into the skin quickly and works very well with other serums, moisturizers and oils. Not only that, I have experienced irritation, peeling and redness from other formulas of retinol (including from The Ordinary), but this does not aggravate my skin at all. I can use it daily because the other ingredients act like a buffer, meaning I get all the benefits without the usual negative side effects that generally come with this type of product. Retinol is a star ingredient in my skincare regime and incorporating this in to it has been a dream for my skin. Everything from the texture, scent, price and ingredients has made it one of my most used serums of the year and the only thing better than all that is the results it gives me. This product (or one of the lower strengths) is a great place to start if you think that it’s time to make the leap into retinol use because for the price and the results, it’s hard to beat. Even though this isn’t a skincare or beauty product I could not leave it off the list because I consider taking supplements as an important step in a complete skincare routine. 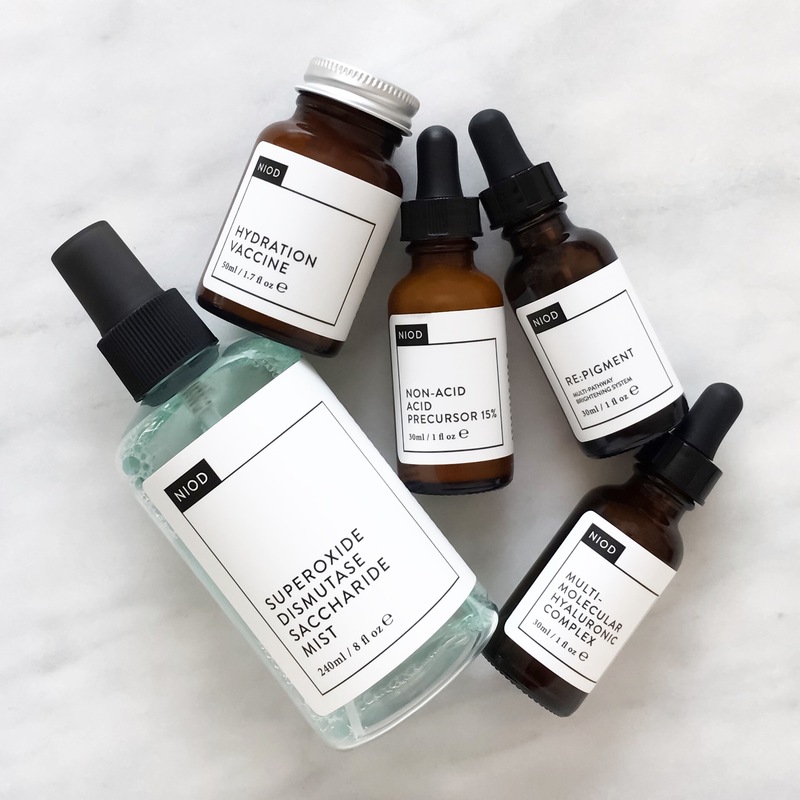 Topical products can only do so much and what we put in to our bodies can sometimes impact our skin better (or worse, sometimes) than any serum or mask. 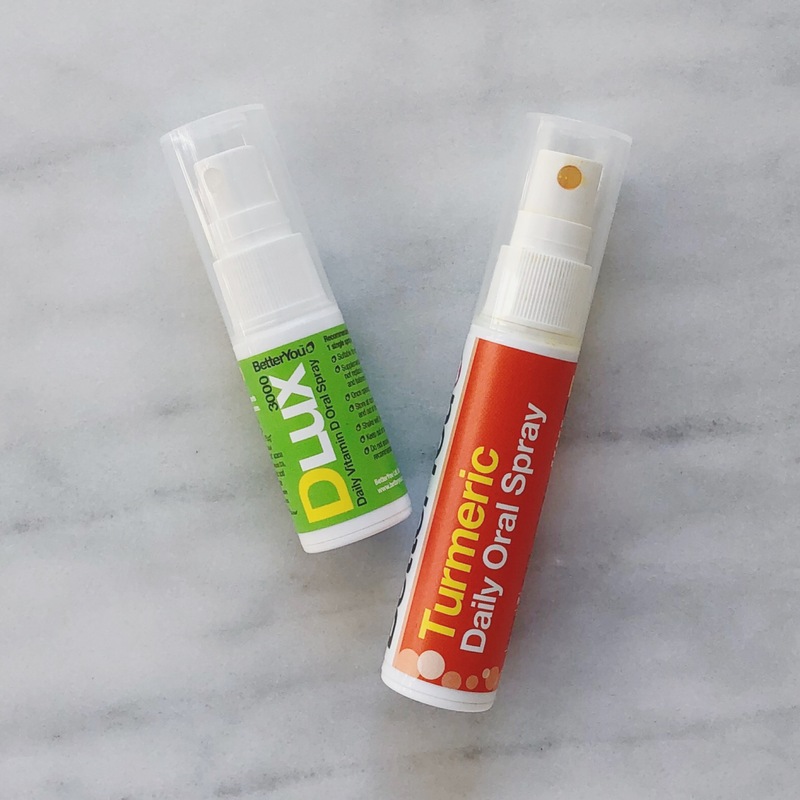 I have used this spray almost every day since it was released (along with the Vitamin D) and it has been such a fun, easy and quick way to incorporate the benefits of turmeric in to my diet. I was so excited when this launched because being of Indian descent, I have known about the health benefits of turmeric for a long time. Despite that, I am not a huge fan of the taste (no turmeric lattes for me) and while I did try the capsules, you need to take quite a few to get the correct dosage. I couldn’t stomach taking that many in the end, which is why this spray is the perfect alternative for me. It tastes like oranges and four spritzes under the tongue gives me 1,300mg equivalent of turmeric root, which gets absorbed directly into the bloodstream. Turmeric has multiple medicinal properties and is a powerful anti-inflammatory and antioxidant due to the main active ingredient, curcumin. This is especially important for the skin because it could help prevent and heal breakouts and protect it from oxidative damage. Not only that, it could help fight chronic disease, depression and potentially lower the risk of heart disease, as well as tackle other major health issues. Inflammation prevention and reduction is probably my number one focus when it comes to my health and skin because in my experience, it is pretty much the root cause of every condition, disease or illness. BetterYou are one of my favourite healthcare companies and I am obsessed with this spray, the Vitamin D products and Magnesium range. If you’ve never tried any of these, I highly recommend them for the overall wellness benefits as well as for improved skin health. I know Shabir touched on this brand and sublingual supplements in the brilliant video with Trinny, so check that out here if you haven’t seen it already. Ingredients: Aqua/Water/Eau, Bifida ferment lysate (Probiotic culture), Citrus dulcis (Orange) flower water, Magnesium chloride (naturally extracted salt), Glycerin (vegetable derived), Lactobacillus, Boswellia carterii (Olibanum) gum oil, Lavandula angustifolia (Lavender) flower oil, Citrus grandis (Grapefruit) peel oil, Citrus aurantium dulcis (Orange sweet) peel oil, Foeniculum vulgare dulce (Fennel sweet) fruit oil, Citrus limon (Lemon) peel oil, Pelargonium roseum (Rose geranium) leaf oil, Origanum majorana (Marjoram sweet) leaf oil, Cymbopogon flexuosus (Lemongrass) leaf oil, Eucalyptus globulus (Eucalyptus) leaf oil, Juniperus virginiana (Cedarwood) wood oil, Michelia alba (Magnolia) flower oil, Argania spinosa (Argan) kernel oil, Quartz powder, Cocos nucifera (Coconut) fruit extract, Glucose (naturally derived), Rapeseed acid (naturally derived), Lactic acid (naturally derived), Lactose (probiotic bifidoculture milk extract), Milk protein (probiotic protein), Whey protein (naturally derived), Citric acid (derived from lemon), Lysine (Amino acid), Sodium chloride (naturally derived), Potassium sorbate (naturally derived), Sodium benzoate (natural preservative), Benzyl alcohol (derived from essential oil), Xanthan gum (naturally derived), Dehydroacetic acid (Ecocert preservative), *Limonene, *Linalool, *Geraniol, *Citral, *Citronellol (*naturally occurring in essential oils). 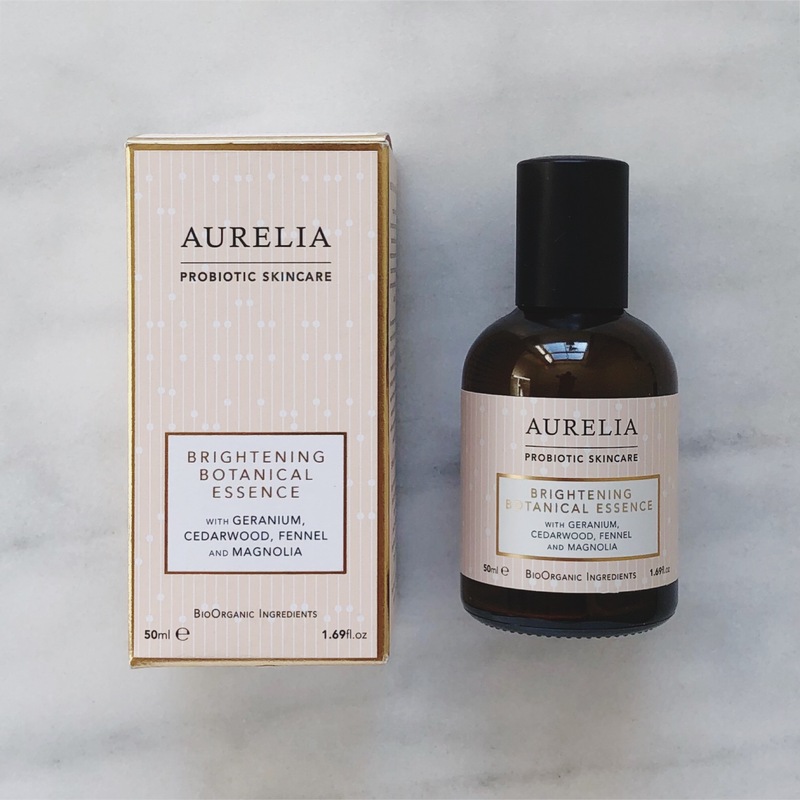 Aurelia has been one of my all time favourite brands for years now (they turned 5 last month) and when they launched two essences last year I was over the moon. I had been hoping for a product like that from them for so long and they did not disappoint. I use this essence/mist all the time and I am currently on my third bottle, with a fourth in my backup stash. It is definitely expensive for how much you get, but just a quick look at the inci list explains the high price. It is packed full of interesting and unique ingredients like probiotics, volcanic water, botanical extracts, minerals and quartz powder that really support and feed the skin. This mist helps to keep my skin bright, clear, calm, balanced and hydrated, but what’s really special about it is the wellbeing factor. The quartz water and essential oils promote inner healing, positivity and a sense of energy and mindfulness. I can’t say that I have noticed this particular effect as I have only used the product on my face as a mist, but I love the idea and anything that could potentially boost happiness is always a plus in my book. It also feels lush on the skin and has so many skin benefits meaning I don’t always have to use a serum. An essence or mist can sometimes seem like an extra unnecessary step, but for me they are one of my favourite skincare categories. I think probiotics can be such a game changer for those who struggle with their skin and an example of a quick, easy but effective routine that I have done many times is: cleanse with the iS Clinical Warming Honey Cleanser, followed by a liberal spritz of this and then finish with NIOD Survival 20. This product could definitely use a size upgrade, but other than that I can’t fault it. Ingredients: Essence of jasmine, iron fillings. 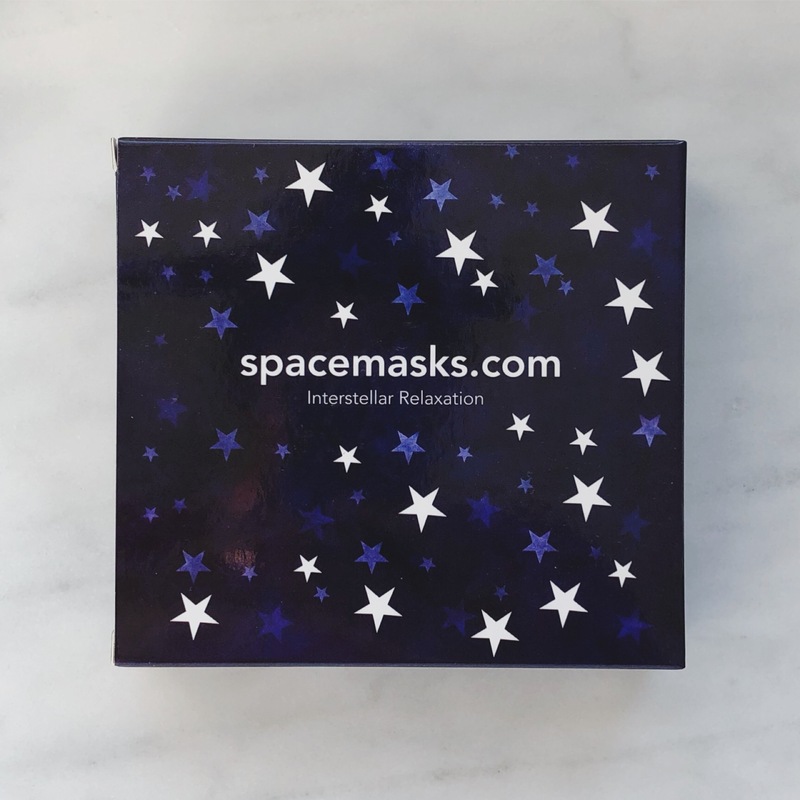 Another inclusion that technically isn’t a skincare product is these amazing masks from the lovely indie brand Spacemasks. I am sure you all know by now that a great night’s sleep is one of the best things you can do for your skin and these masks help to make that happen in the nicest way possible, which is why I had to include them. They are really quite genius and help me to sleep better and wake up looking and feeling better, no matter how late I stayed up the night before. At first I thought these masks were going to be more of a fun gimmick than anything else, but after just one use I was hooked. The warmth (from the iron fillings coming in to contact with oxygen) and light scent of Jasmine help my whole body relax and I find myself feeling so cozy and drowsy within five minutes of putting them on. I usually struggle to switch off and fall asleep when I get into bed and often reach for my phone (very bad, I know! ), but wearing these masks changed all that. Most of the time I am asleep before the mask has even began to cool and that is a major achievement for me. These could be considered somewhat expensive since they work out at £3 per night, but if you have trouble sleeping then it’s money well spent. These have been a lifesaver when I have been ill, spent too many hours sitting at my computer or have been too anxious to sleep after a late night scroll through Twitter. I don’t use them every night, but on the night’s that I do, I absolutely have a much better sleep. Ingredients: Propanediol, Ethylbisiminomethylguaiacol manganese chloride. Despite my love for the Retinol 1%, this product was easily one of the most exciting and advanced launches of 2017 from any brand. Antioxidants are incredibly important when it comes to overall skin health and EUK is the best form of it on offer. I have come to love this product because not only is it a highly intelligent ingredient, but it allowed me to bypass traditional antioxidants from Vitamin C, which my acne prone skin doesn’t tolerate very well. EUK is such an exciting addition to the skincare market due to the unique ability to self-regenerating, which means it can provide continuous antioxidant support. I apply this on the days when I have to work outside and it is a staple for me now. If you don’t get along with Vitamin C like me, then give this a try instead. It should be less irritating for those with acne prone skin and if Survival 10-30 didn’t work for you, you could use this in conjunction with whatever sunscreen you like for a similar effect. I incorporate antioxidants in a number of ways and this is one of my favourites, oh and it goes without saying that the price is a total winner. Ingredients: Probiotic blend 150mg, Equal ratios of Lactobacillus bulgaricus, Lactobacillus acidophilus, Bifido bacteria Total viable bacterial count at time of manufacture per two capsules 1.5billion. Lutein Extract (5% Lutein) 100mg (Providing 5mg of Lutein and 300ug of Zeaxanthin), Burdock Root 100mg, Gotu Kola 100mg, Natural Beta-carotene/carotenoid complex (as D.salina algae) 5mg, (Equiv. to Vitamin A 833ug) Zinc (Citrate) 15mg, Astaxanthin Extract (5% Astaxanthin) 20mg (Providing 1mg of Astaxanthin), Selenium (Methionine) 75ug, Lycopene Extract (5% Lycopene) 6mg (Providing 300ug of Lycopene). In a base of spirulina and alfalfa. This product definitely did not launch in 2017, but I began taking it regularly again last year and I couldn’t leave it off the list as not only is Viridian one of my all time favourite brands in general, but these are among my most consumed supplements. Again, I truly believe that supplements are an integral part of an effective skincare routine and these have worked really well for me in terms of keeping my skin clear and less reactive, which isn’t easy to do over the holidays (hello, chocolate, cheese and sugar!). Each capsule contains an all natural and potent blend of probiotics to improve gut health, which is reportedly linked to acne (in my experience it is), burdock root to aid the detoxification process of the liver, zinc for sebum and hormone regulation as well as wound (blemish) healing, selenium for it’s antioxidant and anti-inflammatory support, gotu kola to even skin tone and encourage “microcirculation detoxifying” of the skin, all in a base of wellness boosting spirulina and alfalfa. Viridian only use the very best ingredients and I will be sharing more about the brand soon. I think I rotate about 6-8 different supplements from them and to be honest, that’s me being conservative. I could easily have more because pretty much all of their blends sound like something I want to take, but right now I am focusing on reducing inflammation, balancing my hormones and improving gut health. Shabir has written about these products twice now (here and here) and they even got a mention in the Trinny video (here), so definitely check those out first if you’re interested in trying this complex. Ingredients: Lentinus edodes mycelium extract, Aqua (Water), Glycerin, Propanediol, Potassium Azeloyl Diglycinate, Butylene Glycol, Acetyl glycyl beta-alanine, Myristoyl Nonapeptide-3, Tetrapeptide-30, Oligopeptide-68, Diglucosyl Gallic Acid, Evodia Rutaecarpa Fruit Extract, Algae Extract, Glycine Soja (Soybean) Oil, Hydrogenated Lecithin, Sodium Oleate, Disodium EDTA, Trisodium Ethylenediamine Disuccinate, Pentylene Glycol, Dimethyl Isosorbide, Ethoxydiglycol, Polysorbate 20, Potassium Sorbate, Sodium Benzoate, 1,2-Hexanediol, Phenoxyethanol, Caprylyl glycol. Last but certainly not less is possibly my ultimate favourite launch of the year (if I had to pick) and one that I have tried to diligently use twice a day, every day because the results are that good. 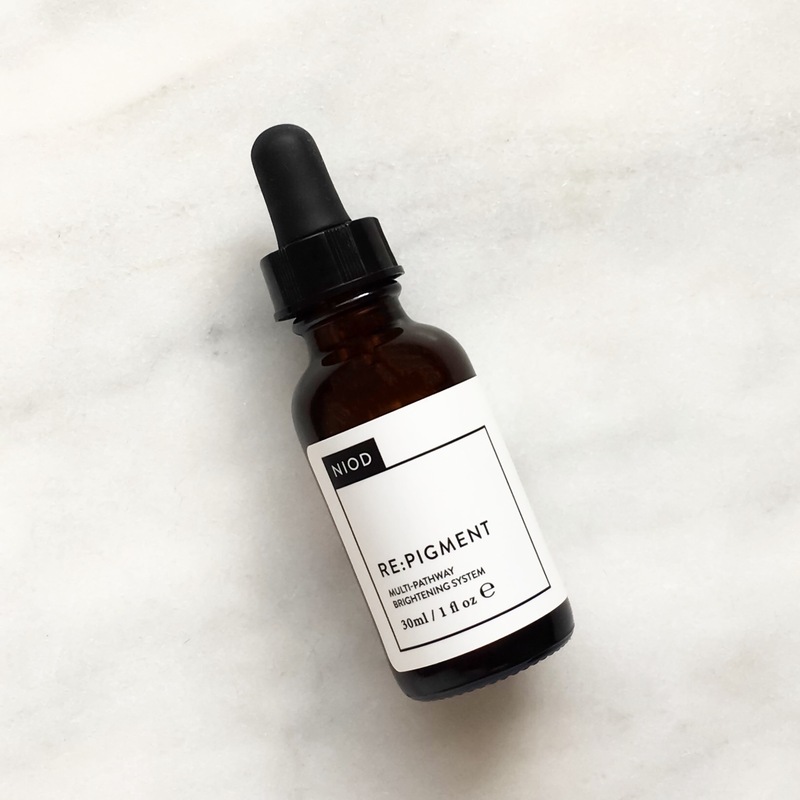 I never expected NIOD to make product that could even come close to CAIS in terms of my wanting/needing to use it every day, but that’s exactly how I feel about Re:Pigment. Having brown skin means uneven skin tone, post inflammatory hyperpigmentation and sun damage are big issues for me. 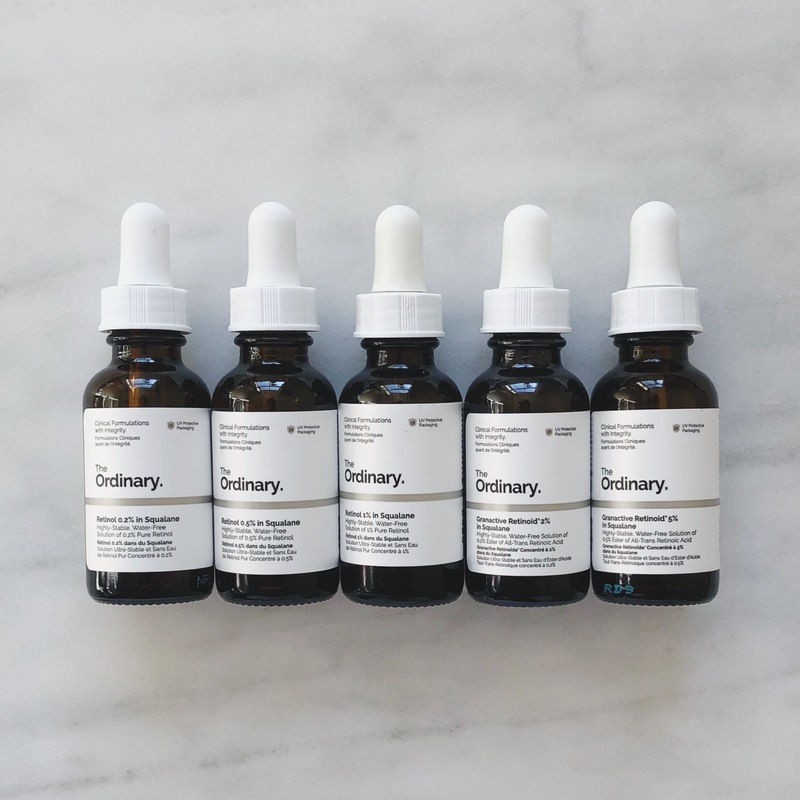 This serum has hands down, without a doubt dealt with all three faster than anything else I have used before, including CAIS (although I love the results of CAIS and RP together). 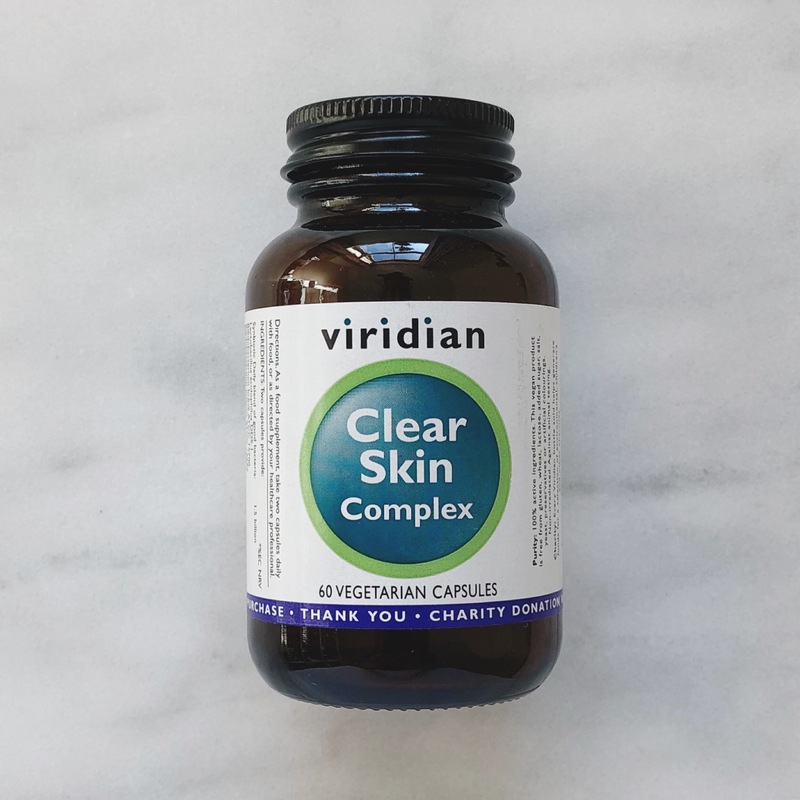 This helps break down and clear dark marks left behind from blemishes insanely fast and that is huge for me because as I said before, my skin doesn’t get on with Vitamin C, which is the ingredient most people would use to tackle these issues. If you have brown skin or suffer from persistent discoloration then give this a try. How long it takes to see full and complete results depends on the type and depth of the pigmentation, but for me I generally start to see results within 3 weeks, which always makes me happy because at least I can see it’s actually working. I have done a full review of this serum that you can read here, so all I will say is that my love for Re:Pigment is 100% real and I can’t be without it. Even though these three are technically updates and not new launches, I had to give them a quick bonus mention because I love them all. Each one somehow improved upon products that were already brilliant in their own way and now I can’t wait for the next update (CAIL) to launch. In the meantine, I have a full review on all three that you can read here. So there you have it – my top ten launches of 2017! Please feel free to share the products you loved the most last year and if any of my picks made the cut for you too I would love to hear why. Thank you for the extensive article. I have a question if I may. The Lixirskin has meant to be the all inclusive and enough for the skincare routine. Do you still recommend using antioxidants like EUK you phrased in addition to Lixirskin products? And what about toners at the end of the cleansing process? Thank you. Hi Marina, I don’t necessarily think that Lixirskin is all inclusive (at the moment), it’s more about having the basics (cleanser/moisturizer/actives) covered. I definitely still recommend using antioxidants and toners if you want to use them. I use Lixirskin in addition to other brands I love and it works very well for me. 1. Is it time to be more on basics with our skincare, in order to avoid the situation that all money, time and effort invested we’d end up “confusing” the skin and getting less and fewer results? 2. I can get an idea of “switching”, but the notion of stopping at all the use of an active ingredient for a week before switching to another every time has really confused me. It seems to go against the idea that the skin has to build a tolerance to active ingredients, so once it did, why not to pursue? What are your thoughts? Do you do those “breaks” of active ingredients for a week? Hi Marinaa, yes I follow this philosophy to some degree. I stick to just 1-2 actives per routine (no more than three depending on my skin) and I find not overloading my skin works well for me. I alternate my actives so to me that’s how I “switch”. There is no one correct method for having a routine so do what works for you. I only stop using something if my skin is not reacting well or is becoming too dry/sensitive, but other than that I am pretty consistent. Thank you, that has been clarifying and helpful.